An IP address is an address used to uniquely identify a devices such as computer,server and printers on an IP network. The address is made up of 32 binary bits which can be divisible into a network portion and host portion with the help of a subnet mask. The 32 binary bits are broken into four octets (1 octet = 8 bits). Each octet is converted to decimal and separated by a period (dot). IP address divided into different classes. Class A (1.0.0.0-127.255.255.255), Class B (128.0.0.0-191.255.255.255), Class C (192.0.0.0-223.255.255.255), Class D (224.0.0.0-239.255.255.255), class D, Class E and Classless Inter-domain Routing (CIDR). Class A—The first octet (8bits) denotes the network address, and the last three octets (24bits) are the host portion. Any IP address whose first octet is between 1 and 126 is a Class A address. Note that 0 is reserved as a part of the default address, and 127 is reserved for loopback. Class B—The first two octets (16 bits) denote the network address, and the last two octets (16 bits) are the host portion. Any address whose first octet is in the range 128 to 191 is a Class B address. Class C—The first three octets (24bits) denote the network address, and the last octet (8bits) is the host portion. The first octet range of 192 to 223 is a Class C address. If you count number of 1 in the bitmask you will get total 25. So the mask of 255.255.255.128 can also be denoted as /25 as there are 25 bits that are set in the mask. CIDR also depicts a more hierarchical Internet architecture, where each domain takes its IP addresses from a higher level. This allows for the summarization of the domains to be done at the higher level. For example, if an ISP owns network 203.17.0.0/16, then the ISP can offer 203.17.1.0/24, 203.17.2.0/24, and so on to their clients. It is required to perform these sort of task as a network/systems administrator in any organisation. Consider, you work in a mid size organisation and you want to deploy 1500 desktop and 100 servers in an organisation. You have 80 network printers and iSCSI will be in operations. In this situation, I prefer to have 5 VLANs configured in core switch, distribution and access networks. why 5 because you need management vlan for all the switches you will be installing and rest four vlans. It is always good idea to get more IP then you need that will help you in future if your company expand. This is just an example and passing my time. It will definitely be different in your circumstances. Don’t worry about this binary and decimal calculation. 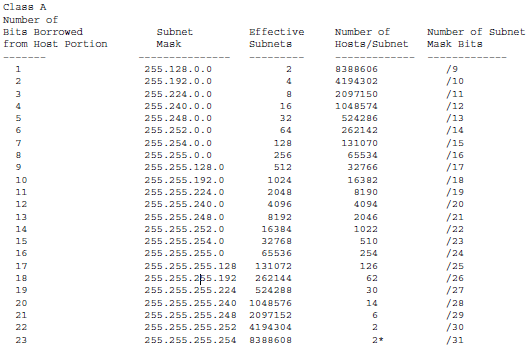 Download solarwinds subnet calculator free tool and do it smooth as silk.